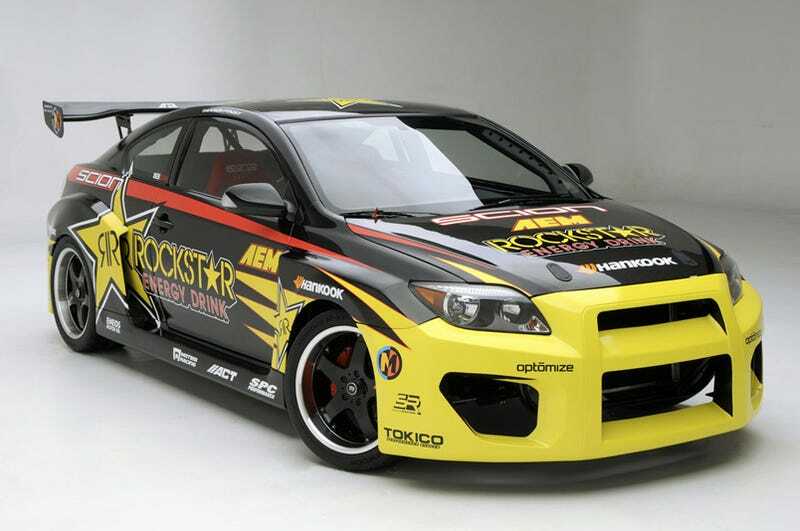 U.S. Top Gear non-host and racer Tanner Foust, a champion drifter, has traded in his Nissan 350Z to get fast and furious with this: a RWD, NASCAR V8-powered Scion tC Formula Drift car. This car could not be less like a real Scion tC if it tried and, for drifting, it's probably a good thing it isn't. First, the car has been converted into a more drift-appropriate rear-wheel drive setup. Gone is the dinky four-banger, replaced instead with a Toyota NASCAR V8 putting out 650 HP and 450 lb-ft of torque through a four-speed shifter. The car was prepped by AEM and is a beast to behold. The car will compete in the Formula D series and, obviously, is still sponsored by Rockstar Energy Drink.